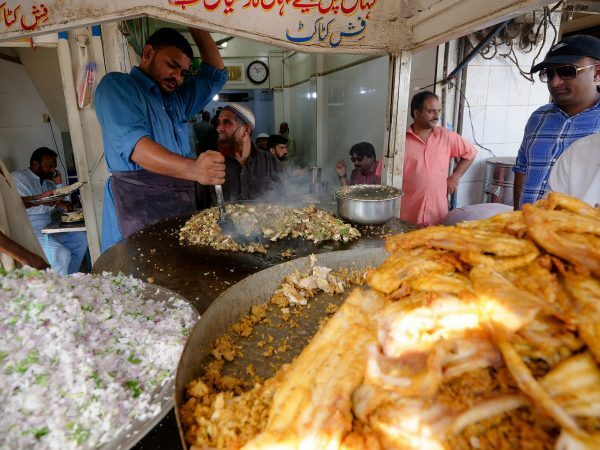 Do you know the two main reasons why street food stalls are packed with customers? One is because they serve delicious food, and two is because they sell budget food (cheap prices relative to the country). And I’d say a good location, like with any business, helps with both. One day, as I was searching for for something to eat for lunch while prowling the streets of Saigon (Ho Chi Minh City), I came across a street food stall that was packed out, right along Cao Thang road. It looked like everyone from office workers to security guards were sweating in the midday humidity, all while slurping down bowls of piping hot noodles. They were eating a dish known as Hu Tieu Nam Vang, so I grabbed an open seat at one of the metal tables lined up on the sidewalk, and ordered myself a bowl. For just 22,000 VND ($1.02), I wasn’t expecting anything too spectacular. What is Hu Tieu Nam Vang? 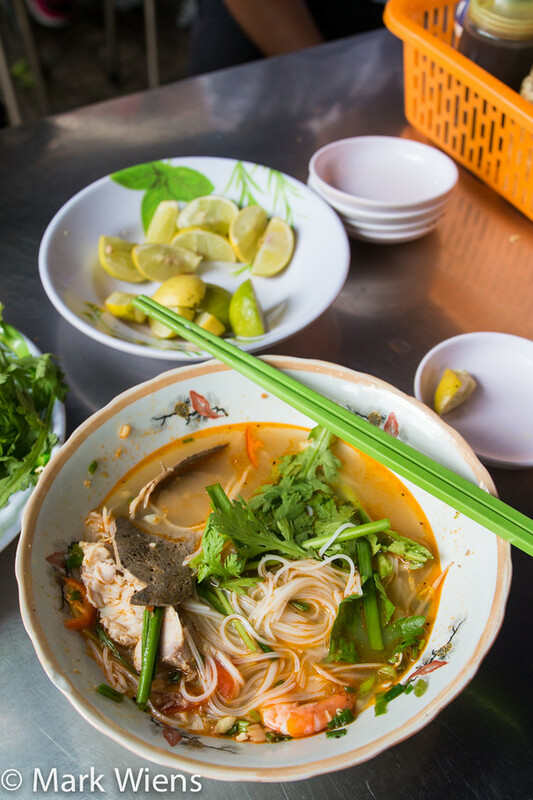 One of the many types of single bowl dishes you’ll notice frequently as you walk around the streets of Saigon is Hu Tieu Nam Vang. 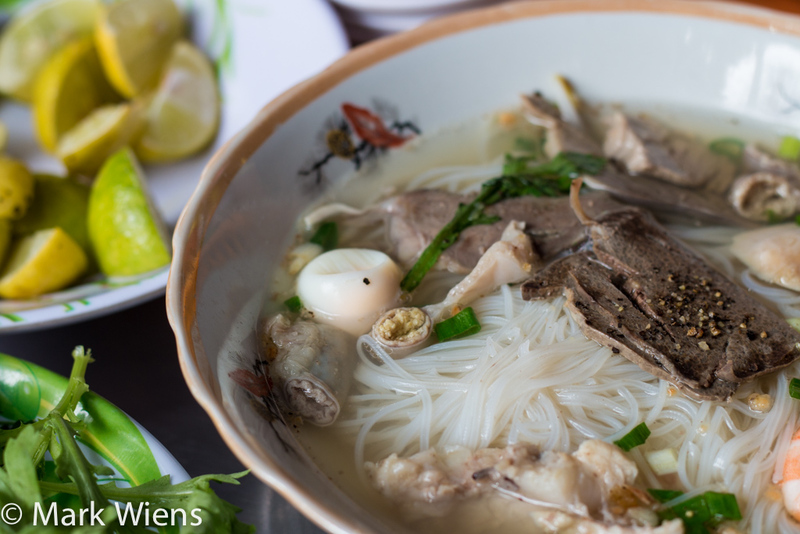 Hu tieu originally comes from kuy teav, and in its simplest and purest form, is a soup, normally made with pork bones, and served with a variety of different types of noodles. Nam Vang is the Vietnamese word for Phnom Penh, the largest and capital city of Cambodia. 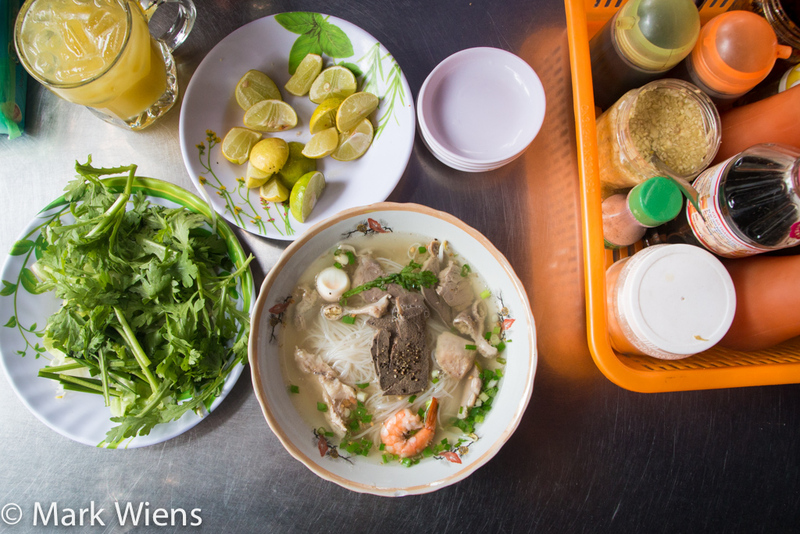 Together Hu Tieu Nam Vang translates to Phnom Penh Chinese noodle soup, a dish that has roots in both Cambodian and Chinese flavors, yet it’s incredibly popular in southern Vietnam. I honestly don’t begin to know all the complications and the history of the dish, but there’s a more detailed, and interesting post about it over on Viet World Kitchen if you’re interested in knowing more. 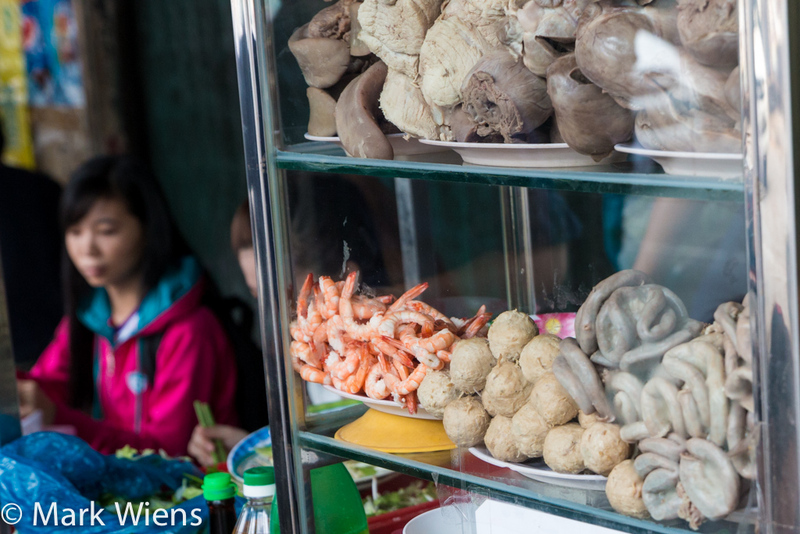 Over the course of my visit to Saigon, and throughout my food explorations, I noticed the price of food, like one might expect, directly dictated the quantity of protein. A bowl of noodles for a dollar or less, like the one I ate here, would most definitely not include much protein, and would mostly be heavy on the noodles. I knew that going in. 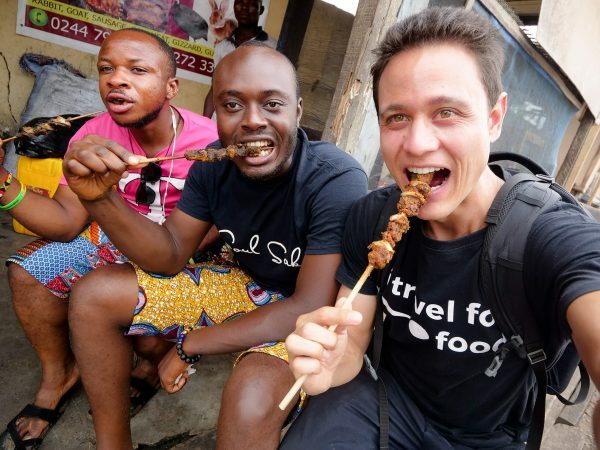 But street food is not only about the taste or the quality of food, though of course that’s important much of the time for me, but it’s also about the atmosphere, and just experiencing a local casual meal. The atmosphere and the street food situation was quite similar to the the mohinga pop-up stall in Yangon – all of a sudden I found myself within the middle of a street food rush, ordering something piping hot in a bowl, and loving every moment of it. My bowl of Hu Tieu Nam Vang included a good amount of soft rice noodles, topped with some slices of pork, liver, intestines, a quail egg, and finally a shrimp, all sprinkled with a touch of pepper, and some chopped green onions and cilantro. 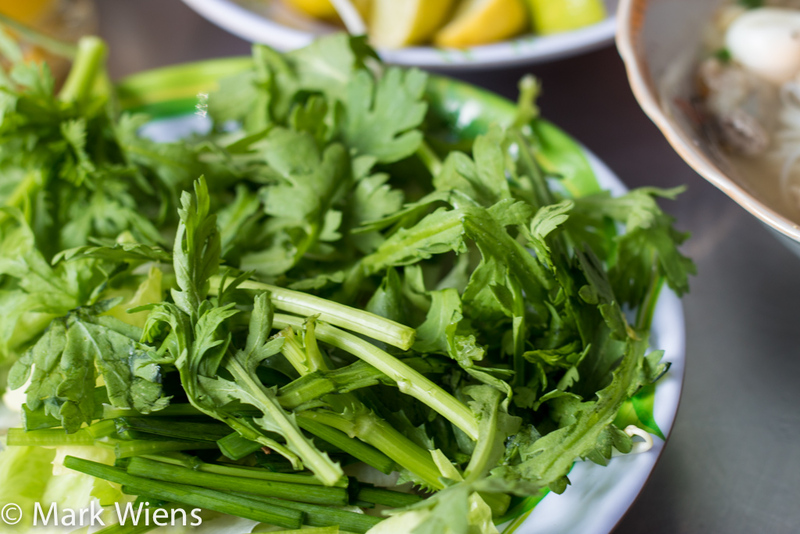 In the center of all the communal metal tables were plates of raw vegetables to garish, including green onions, cabbage, and what I think was chrysanthemum greens, a wonderful green and crisp vegetable. Along with tossing in handful after handful of the greens as I started to eat, I also doctored up the soup broth with some chili sauce and a few squeezes of fresh lime juice. The Hu Tieu Nam Vang had a nice mellow pork flavor in the broth, it was both slightly salty and slightly sweet, and had a nice richness to it. The noodles were soft, similar to pho, and the meat was good, yet not to plentiful. What I really loved about this bowl of Hu Tieu Nam Vang, was getting to dress it the way I like it. It was satisfying, nothing extremely rave worthy, but what I really liked was just being able to enjoy a local Vietnamese lunch, nothing too thrilling, just an everyday bowl of noodles at an ordinary noodle stall in Saigon. 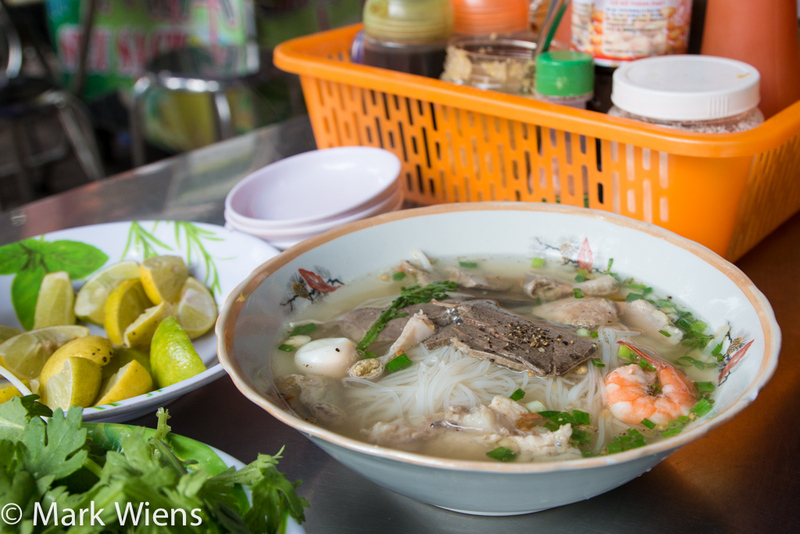 Hu Tieu Nam Vang is one of the many popular noodle soup dishes in Vietnam, extremely common as a street food in Saigon. 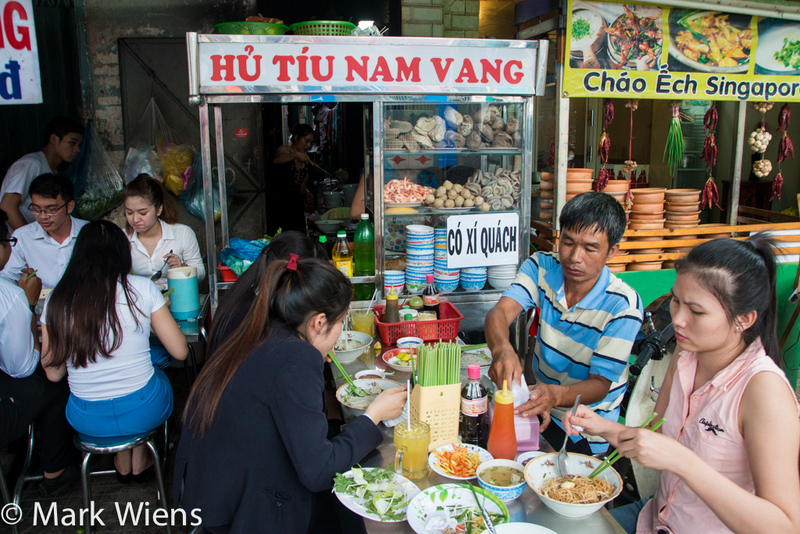 While exploring Saigon, I bumped into this packed street food stall serving Hu Tieu Nam Vang, and since there was such a large gathering, I decided to grab a seat and order. The rice noodles were served in a pork bone broth, including a few pieces of meat, a quail egg, and a prawn, to which I garnished with green herbs, and chili sauce. It wasn’t the most impressive bowl of Hu Tieu Nam Vang I had in Vietnam, and overall I would choose to eat rice and curry most of the time, but it was quite cheap for being in the heart of Saigon, and it was a great street food atmosphere. 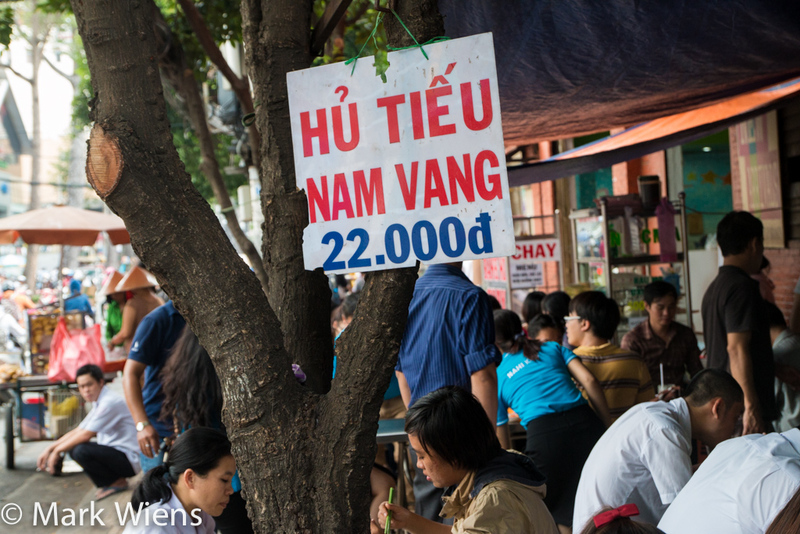 How to get here: You’ll find Hu Tieu Nam Vang street food stalls in Saigon just like this all over the place, and I think if it’s about this price, it will probably be a similar taste and mixture. 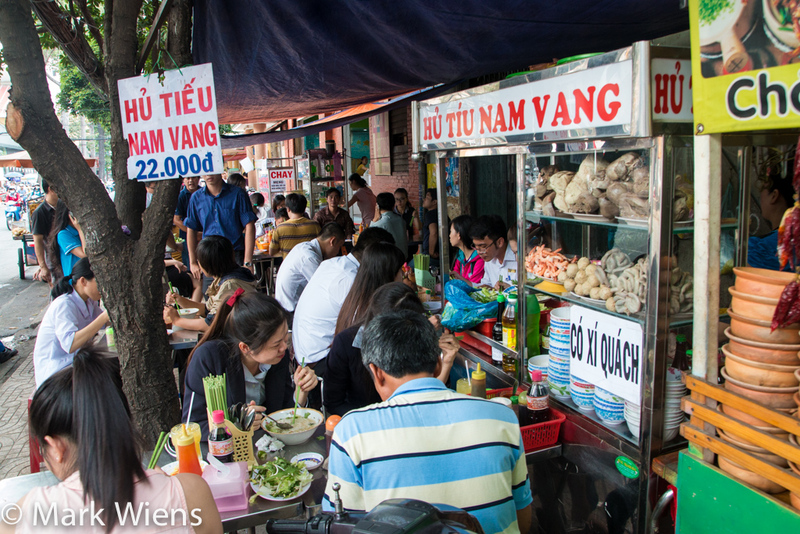 This exact street food stall is located on Cao Thang road. After eating there, I found this Vietnamese link to it, and also you can check out my Saigon food map below. On the left hand side click on “# 9” and it should highlight on the map for you. The hu tieu Nam vang. Looks delicious bro. Love to be there at that moment too. Too often when you see a crowd in Vietnam for food ; it is usually cheap budgeted and delicious. I have heard that average office workers and laborers in Vietnam typically don’t make much money that is why they crowded budggeted eateries . By the way love your adventurous spirit. I love to see you try Banh Cuon. And tell us about it. Cheers. Hey Jake, thank you very much, glad you love Vietnamese street food as well. I really loved banh cuon, one of my favorite Vietnamese snacks. Hi Adriana, great to hear you’re planning to visit Vietnam in the future, I think you’re going to love the food. Thank you for reading! That food looked fantastic and for only 22,000 VND you can’t really go wrong. Also, your photos are really high quality. What kind of camera setup are you using for these? Thank you Nathan, I’m using a Canon 70D, usually with a Tamron 17-50 mm lens and sometimes a 50 mm. Street food has got a fun element to it, besides the great taste! 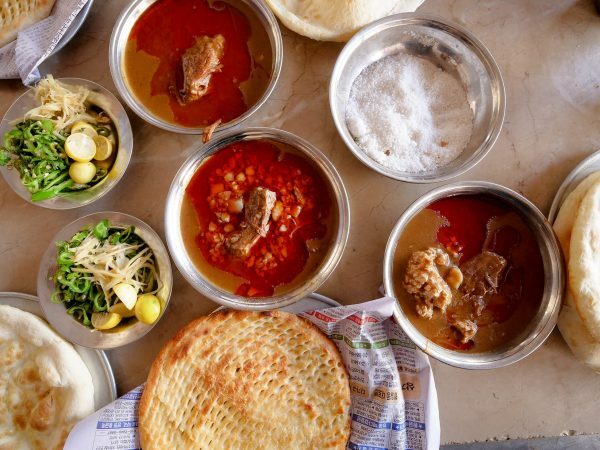 Since I am from India, I know what it is to have a mouthwatering street food! 🙂 I would love to explore the tastes of other Southeast Asian countries, too. Hey Renuka, you’re right about that, and India is definitely home to some of the best street food culture in the world. Hope you can visit Vietnam, there’s so much good food to eat. 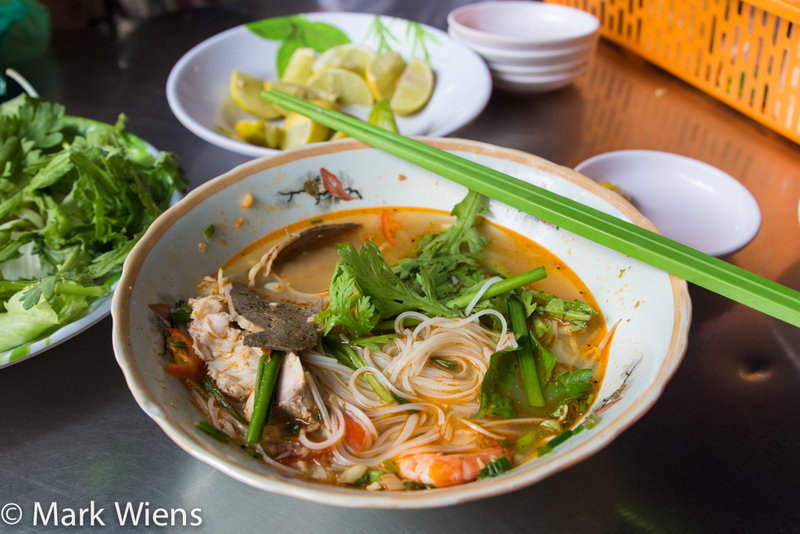 So many amazing cheap eats in Saigon … can’t wait until I get back there next winter! Really enjoyed this post. Thanks. The bowl of noodles highlighted in this blog is just the kind of thing that brings me to my comfort zone. Hi Kwong, thank you very much, glad to hear that!